Ask Boulderites what they care most about when choosing a restaurant and you’re sure to get a variety of responses and considerations. Is the food healthy? Are the ingredients local and organic? Is the food made with sustainability in mind? Will I be supporting local businesses and suppliers by eating here? Is the restaurant dynamic and a unique Boulder environment? Is the food itself interesting and, most importantly, will it have me salivating? 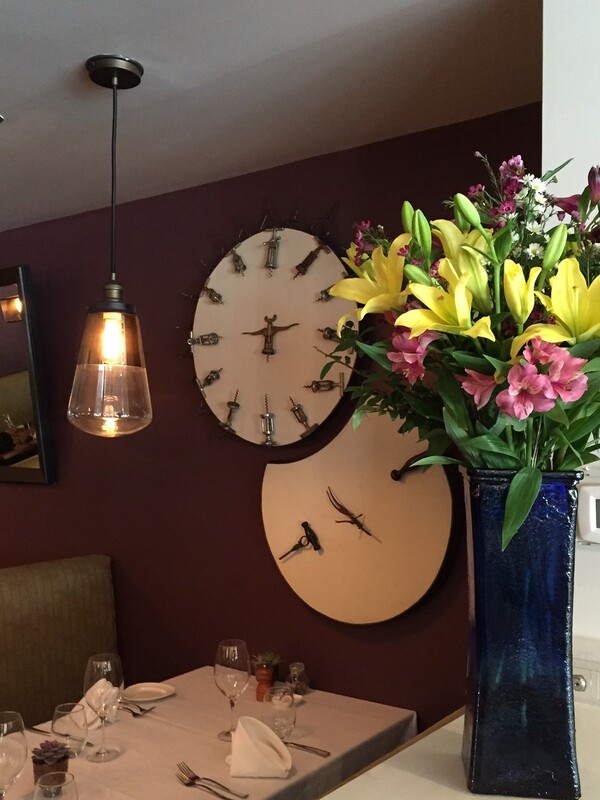 Whether any or all of these questions go through your head when choosing a place to eat, Arugula Bar e Ristorante at the corner of Iris and 28th here in Boulder will more than exceed your expectations in any and all categories. Arugula is a harmonious blend of many philosophies, ideas, and styles. While there is an emphasis on local ingredients, produce, and suppliers, dishes are also inspired by the vast and creative foods of the world. While Arugula’s method of cooking is old-fashioned and traditional, each dish also has a unique modern twist, giving plates an air of carefully crafted fine art. While plates are creative, colorful, and vibrant, they are also hearty, simple, and naturally nutritional, making your meal a wildly varied yet wholly complementary experience. Arugula is the brainchild of Chef Proprietor Alec Schuler, a graduate of the University of Colorado Boulder and proponent of living a sustainable, healthy, and delicious lifestyle. Inspired by his studies at the Natural Gourmet Institute in Manhattan, his background in nutrition-oriented cooking, his experience working in some of Boulder’s most famed historical restaurants, including L’Atelier, as well as his many trips to Europe and Italy over the years, Schuler opened Arugula in 2009 with the goal of creating classic Northern Italian cuisine interpreted with a modern, artful twist. immense amount of care and forethought. “The world is our inspiration,” says Sven Hedenas, Executive Chef at Arugula. Emphasizing Arugula’s commitment to cooking from scratch, Hedenas says that he often finds inspiration and ideas in classic dishes, even 100-year-old recipes, but is always simultaneously looking to find a way to make that dish exciting, fun, and new for customers. Each plate is a piece of art in and of itself, with the ingredients creating a canvas of color and intrigue almost (I repeat, almost!) too beautiful to eat. With spurts of creative ingredients in their dishes, Arugula’s plates are unique yet rooted in familiarity for the customer. How a course is built at Arugula is a unique process in and of itself. 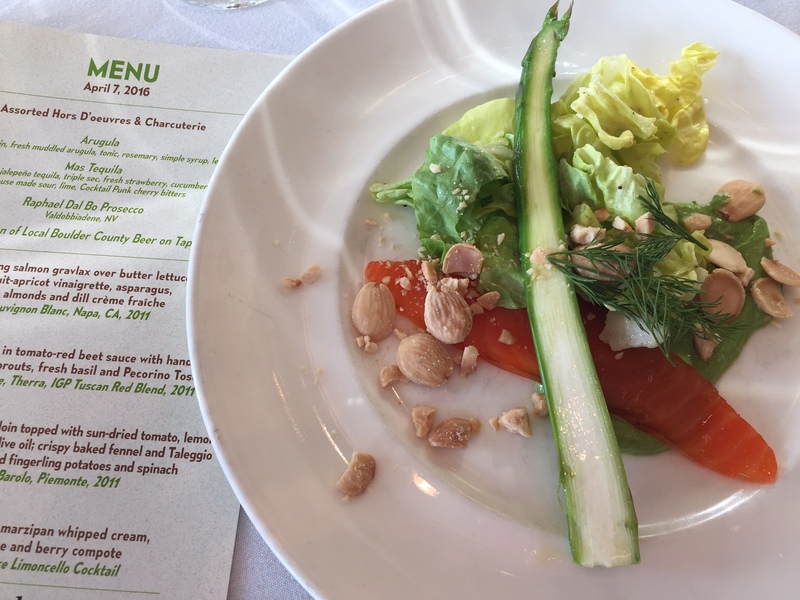 Instead of pairing a wine to a preexisting dish, the team, including General Manager and Wine Director Ari Karra, will often begin by tasting a glass of wine and will then construct the dish based on the flavors of that wine. This results in a variety of unique and seasonally specific opportunities in dishes, such as adding an unexpected dash of beets to a pasta dish because of the fruitiness picked up from the starting wine. The addition of every ingredient is purposeful and deliberate, making the dining experience at Arugula even more whole and immersive. “I became enthralled with the items’ histories,” says Schuler. 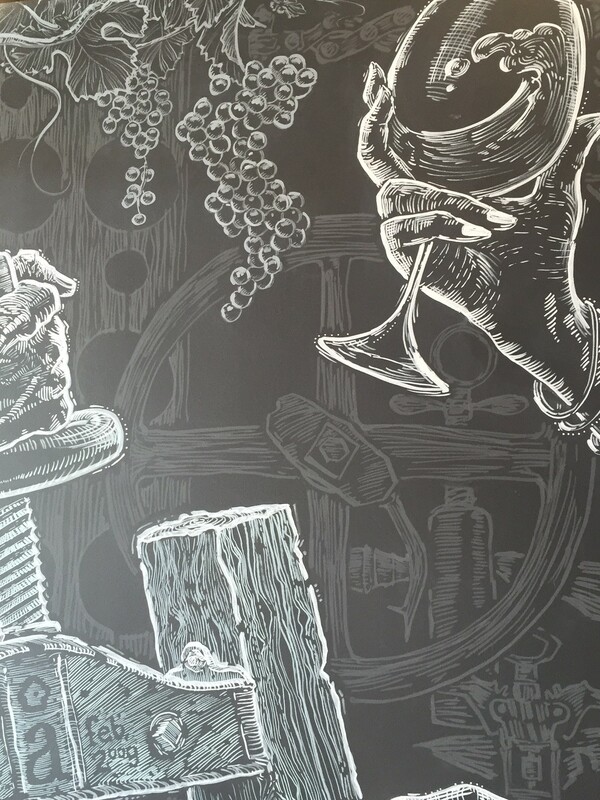 “How many bottles of wine have those corkscrews opened?” Commissioned by Schuler himself and created by local artist and craftsman Javan M. Stackley, the dynamically arranged antiques range from circuitous patterns to larger, monochrome collections. Complementary chalk art by local artist Bryce Widom further gives movement and intrigue to the space. The most significant element of Arugula’s recent re-launch is the ever-evolving creation that is their new menu. Arugula now reprints their menu twice each week. According to Schuler, Arugula changes about twenty to thirty percent of their menu each Friday, allowing them to be creative and experiment with their dishes and giving them the flexibility to utilize whatever unique local ingredients they’ve come across at that time. The menu is further refined on Tuesdays and is often informed by upcoming wine dinners, seasonally available ingredients, and the creative whims and creations of Arugula’s talented team. Upcoming events at Arugula include a May 17th wine dinner where they will partner both with Boulder’s Cured and Chester Osborn, Chief Winemaker for d’Arenberg, to ring in the spring season with items like Rocky Mountain elk carpaccio, butter poached king crab leg, and unique fruity, fresh desserts. Arugula likewise partners with a local brewery annually for a beer dinner, celebrating the many facets of a great craft beer through unique and intriguing food pairings. This year’s beer dinner is on June 21st and will feature Gravity Brewing in neighboring Louisville. If you’re looking to enjoy Arugula’s and Schuler’s unique and refreshing take on delicious cuisine from sun up to sun down, you can also visit Schuler’s breakfast restaurant, called Tangerine, which is adjacent to Arugula and features traditional breakfast and brunch fare with a Mediterranean, healthy twist. If you’re looking to book a private event or party, likewise check out Amaro, the shared event space between Arugula and Tangerine, where private groups can enjoy a unique atmosphere, local craft beer, wine, and spirits, and undeniably delicious and rich food and fare. 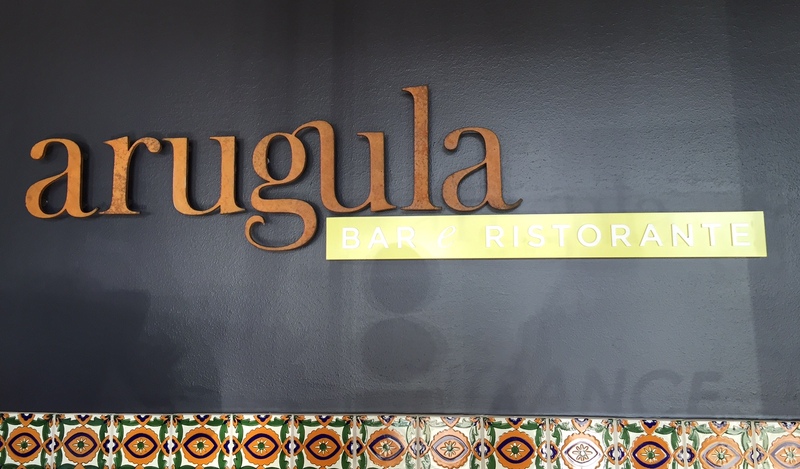 Whether you’re looking for a cozy, romantic atmosphere, a hearty Italian meal, a bit of unique Boulder history and flavor, or all of the above, Arugula is a must-visit restaurant in Boulder sure to both surprise and delight you.